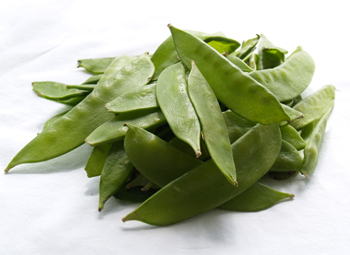 Snow Peas are thin, tender pea pods with small, undeveloped peas inside them. They are eaten whole, not shelled. Some people still string them. This is a hold-over from a few decades back, but it is no longer necessary with most of today’s varieties. To prepare, just wash and trim the ends. If they are fresh, they should be crisp enough that they snap when you break them. When buying fresh, choose those with the smallest seeds, with the peas inside just barely starting to show, and avoid any wrinkled or limp pods. The frozen ones are also excellent, if not superior in taste and nutrition to the fresh, because of how quickly they are frozen after harvesting. Wash, top and tail (the ends will just break off), remove strings. Store unwashed in a plastic bag in the fridge and use within 3 days. Freezing: Wash. Remove any blossom stems or bits, but otherwise leave whole. Blanch small ones for 1 1/2 minutes; medium-sized ones for 2 1/2 minutes. Plunge in cold water, drain, package, and freeze.